Back to school essentials aren’t cheap. According to the National Retail Federation, parents will spend an average of $669.28 on supplies for kids in grades K-12 this year, nearly a third – or $212.35 – on electronics. You hope purchases will last until next school year – or longer for those expensive gadgets. Unfortunately, that’s often not the case for high tech. 80% of all incidents occur within a year of purchase. What’s a parent to do? We’ve put together the following tech checklist to help you make the most of your back-to-school budget. We’re also giving away a $500 Visa gift card to stretch those dollars even further! Not surprisingly, the most popular devices for students include cellphones, tablets and laptops. Three quarters of students use phones and laptops at school with more than half turning to tablets. When making your list for younger kids, consider that most parents say 10-12 years old is the right age for a first cellphone. By the time they graduate high school, two thirds call smartphones “essential” for school. Review assignments for your child’s new grade. If they’ll have more research reports or need to include photos in lab reports, it may be time for a new laptop or tablet. Four out of 10 parents replaced a phone for a family member in the last 18 months, compared to less than one in four for couples with no kids. More shocking, half of laptops and tablets won’t make it through two grades undamaged. Several companies make ruggedized and/or water resistant models of smartphones and tablets, reducing the risk from a drop to the concrete or into the toilet. Screen protectors, cases and sleeves are also great options to protect phones and tablets. For laptops, set rules such as where it may be used. With the price of many phones traditionally spread over the life of a two-year contract, many parents are surprised to find the average replacement cost of a smartphone is $500 after an incident. If you are wondering what it would cost to replace the phone you are thinking about buying or recently purchased, look for the full retail price (the price without a contract) or check your receipt for the price before discounts. Of course, we believe one of the best ways to check off numbers two and three is to add protection from your wireless carrier or get a product protection plan powered by Asurion at your local retailer. Even if you’ve already finished shopping, many stores will let you sign up for coverage for up to 30 days after purchase. 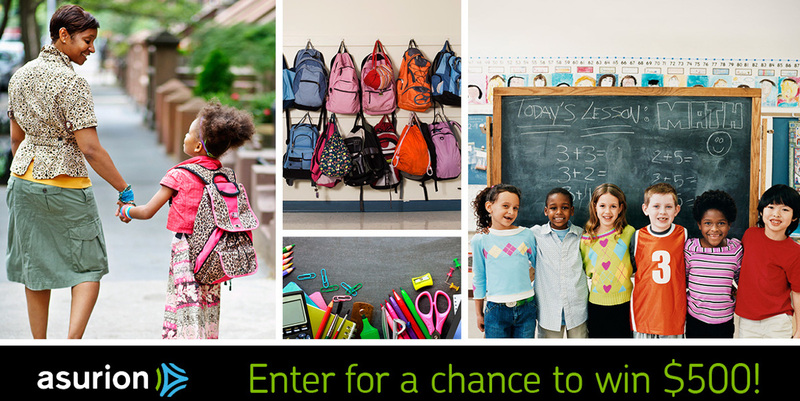 We’re kicking off the school year by giving one winner a $500 Visa gift card to help buy back to school essentials.